Are you ready to grow your Pinterest followers? You’re already doing all the things to grow your Pinterest presence organically, but now it’s time to focus on growing your followers. Let me introduce you to one of my favorite tools, MiloTree. 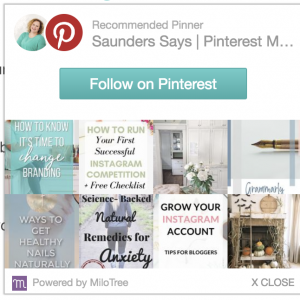 Not only is MiloTree an effective tool to grow your Pinterest followers, it can be used for other platforms. 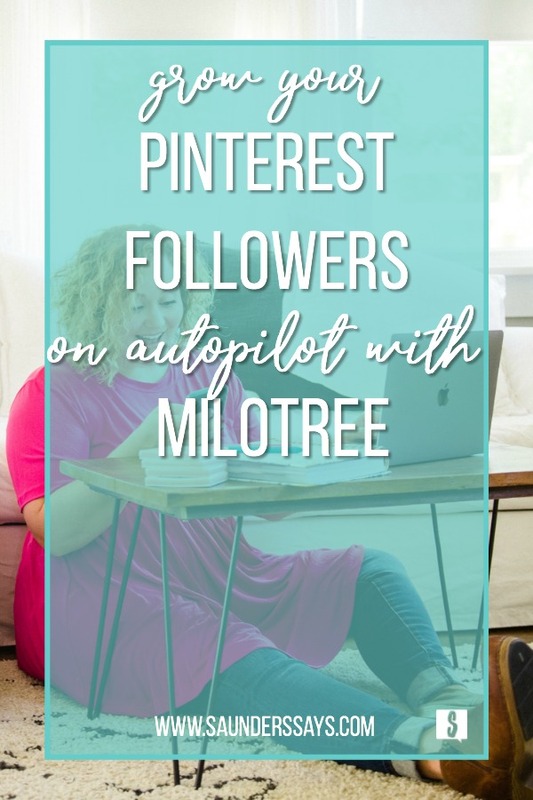 While I specifically use MiloTree for Pinterest followers, it can be set up to grow YouTube subscribers, email subscribers, Instagram followers, and even Facebook Business page fans! Talk about an easy to use conversion tool. So what is MiloTree? Well, it is an easy to use, low cost, pop-up for your website or blog. In about 2 minutes, you can set-up your own MiloTree pop-up and try it out for a 30-day free trial. After the 30-day trial is over, you can continue using this tool for just $9/month. Yall, that is super cheap considering you can grow your Pinterest followers while you’re sleeping, eating, laundry, or whatever else is on your to-do list. My favorite feature of the pop-up is that you can customize it to match your branding and website. I love that my pop-up is Saunders Says teal! Another neat feature with the pop-up design is the ability to remove the MiloTree logo on the bottom left. However, I choose to leave this logo–I’ll explain more about that later in this post. In addition to the colors, background, text, and button colors, you can also choose which direction you want the pop-up to show up from on both mobile and desktop. I prefer the right side for the pop-up on both mobile and desktop. Just a personal preference there, but you can pick from right, left, bottom right, or bottom left on a desktop and left or right on a mobile device. Oh, wait, don’t want your reader to be bombarded by a pop-up immediately on your site? You can set a delay on the pop-up so that it won’t show up until the reader scrolls down! Since I’m using MiloTree to grow Pinterest followers and no other platforms, I have my pop-up set so that it only shows up every two days for the visitor. This keeps the visitor from being frustrated if they visit my site multiple times in one day. However, you can use MiloTree to grow your other platforms and you can build it so that single visitors do not see the same platform each visit. Think of this pop-up as a call to action–you don’t put multiple CTA’s in one blog post or social media post, so you won’t do it on the pop-up either. MiloTree also has analytics so you can see your growth. I can see exactly how many pop-up clicks I’ve had since installing the MiloTree pop up on my website. It also shows me how many clicks I’ve had over the last week. You can basically count those clicks as new followers. MiloTree also shows me how many Pinterest followers I have and how many I’ve gained this past week. The simplicity of these analytics helps me see the benefits to using MiloTree. If you’re ready to grow your Pinterest followers, sign up for MiloTree now! As I mentioned earlier, I choose to leave the MiloTree logo on my pop-up because it allows me to make affiliate income if someone decides to sign up for the service. I do not mind sharing that I LOVE and use MiloTree to grow Pinterest followers because it allows me to make some passive income. MiloTree is a generous affiliate partner and they pay $20 per conversion! I first tried MiloTree in February, but didn’t tell anyone about it until late March. Since March, I’ve made about $80, which is not much on the grand scheme of things. But y’all, I’ve done NOTHING but have the pop-up installed and I told two of my favorite bloggers about it. That’s it. Seriously. I’ll take my $80 for doing nothing any day! Of course, you must have a paid account to be eligible for the affiliate partnership. You can sign up for an account here. If you’re like me, you’re constantly looking for new ways to bring in some passive income. Well, you’re in luck because MiloTree is hosting a webinar on October 17th at 12pm CST about making money!! The webinar is actually called “How to Make More Money in Q4 Than Ever Before!” and I am super excited to learn all about this topic! I know you’ll want to join me for this hour-long webinar to make some money this holiday season and end the year with some extra cash, so you can sign up right here! Jillian Leslie, founder of MiloTree, and Paula Rollo, creator of Quick Blogging Tips, will share their amazing skills, tips, and tricks to help us crush quarter four! Specifically, they are covering ways to optimize old content, how to use the Google Search Console, connecting with brands, and more! Are you using anything to grow your Pinterest followers? If not, I highly suggest you sign up for the 30-day free trial with MiloTree! I think you’ll be pleasantly surprised by your growth! Leave me a comment and let me know your results! « What Are Pinterest Communities? Pinterest is a beast! Thanks for these awesome tips! I’ve never heard of this tool – thanks for sharing all the good info! I’ve been meaning to add something like this to my blog! I’m going to give them a closer look! Milotree is such a great tool for increasing Pinterest followers!